When 5,000 people were asked if they’d received any praise or acknowledgement from their employer in the past year, only 7.6 percent answered “yes.” More importantly, when those 380 people were then asked how long ago it happened, the answers were from one week to 37 years ago. Finally, and most tellingly, when asked if they still have the letter or certificate to show for it, 91% answered positively. 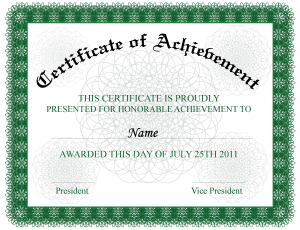 Bottom line…When it comes to employee motivation and retention, nothing beats a personal letter or certificate of recognition. It is something that costs next to nothing and, yet, is highly cherished. What’s keeping you from taking a few minutes of your time to give your most valued employees a meaningful morale boost? Please don’t wait until one of them gives notice.